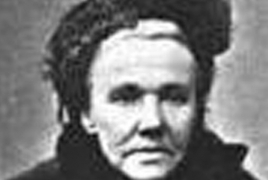 PanARMENIAN.Net - Notorious ‘Mother’ or ‘Marm’ Mandelbaum was born as Friederike Henriette Auguste Wiesener to the family of a Jewish merchant in the German city of Kassel in 1827 (some sources mention 1825 and even 1818). She had two older brothers and four younger siblings, one of whom died in infancy. As a young Jewish girl, Fredericka was expected to help with gender-defined household duties and also get a basic education that included reading, writing, and arithmetic. As result, she developed a keen intellect, a strong work ethic, and confidence in her own abilities. In her early twenties, Fredericka married Wolf Israel Mandelbaum, a peddler from a community nearby. They moved to the United States in 1848, landing in New York and opening a general store. In the beginning, Mandelbaum and her husband worked as flamboyant street peddlers, building relationships with both the hordes of aimless children and the petty thieves looking to get rid of their stolen loot. By 1865, Mandelbaum had opened a shop on Clinton Street to act as the front for her burgeoning criminal operation. Her husband, described by Sophie Lyons - a woman who would later become Mandelbaum’s star student and protégé - as “rather weak-willed for his calling, lazy, and afflicted with chronic dyspepsia,” took a backseat while Marm built a criminal empire. Fencing stolen items became Mandelbaum’s main hustle. Stealing anything from jewelry to furniture, a criminal sold it to Mandelbaum, who, in turn, would sell it to another buyer. Mandelbaum’s favorite items were bolts of silk and diamonds, both of which she could buy for cheap and sell at a huge mark-up. Reportedly an ugly woman, described as “greasy, fat, and opulent” or “a gargantuan caricature of Queen Victoria with her black hair in a roll and a small bun hat with dropping feathers,” what she lacked in physical appeal, she certainly made up for in shrewd intelligence. Not content to wait for stolen goods to come to her, Marm planned, arranged, and bankrolled numerous crimes, as well as provided the means to unload the ill-gotten gains through her vast network of thieves, pickpockets, scam artists, cab drivers, jewelry smiths, police officers, and defense attorneys. “The American is system is, ‘You get what you pay for,’” she used to say, according to J. North Conway, author of “Queen of Thieves: The True Story of Marm Mandelbaum and Her Gangs of New York”. After her husband died in 1875, Marm’s criminal enterprise, as well as her political influence, continued to grow. To help protect her operation, Mandelbaum kept the prestigious law firm, Howe & Hummel, two of the most devious and successful criminal lawyers in the country, on a $5,000-a-year retainer. Whenever a member of her gang got into trouble, she offered bail and legal defense if it was needed and bribed police and judges to fix the case. She called her criminals “little chicks” and hovered over them like a mother hen. Having financed some of the greatest bank robberies in America, ‘the greatest crime promoter of all time’ is estimated to have fenced as much as $10 million in stolen property (around a quarter of a billion dollars when adjusted for inflation). Mandelbaum once arranged a successful jail-break to get her favorite piano player, Piano Charley Bullard, out of prison since she missed the piano concertos he played at her extravagant parties. Bullard, a handsome, raffish, classically educated piano player, was also a notorious safecracker who squandered his ill-gotten gains on wine, women, and gambling. ‘Marm’ never got her hands dirty, instead building an inner circle of burglars, pickpockets, and robbers. To grow and support this network, she is said to have created a school that would train the many children living on the streets to be criminals. The school was open for young men and women, who came to learn the criminal trades from professional thieves, pickpockets, and conmen. The students started off learning about smaller crimes like pickpocketing and petty theft. They would be taught about things like misdirection and the finer points of thieving, then, if they had a knack for it, their training would advance. The Grand Street School operated for only about six years, closing down around 1876. Mandelbaum shut down the school when she found out that the son of a police official had enrolled. Rather than let this suspicious new student learn the ropes, risking her entire empire, she shuttered the school. Mandelbaum’s reign as the Queen of Thieves came to an end in 1884, when New York City’s avowed crime-fighting district attorney, Peter Olney, with the help of Pinkerton detectives, caught her in a sting operation. Undercover detective Gustav Frank sold Mandelbaum several bolts of stolen silk that had been secretly marked. When detectives raided her store and found the silk in her possession, they arrested her. On July 22, 1884, detective Frank, with an arrest warrant in hand, approached the carriage in front of Mandelbaum’s haberdashery shop. Inside was Mandelbaum, her twenty-four-year-old son Julius, and her most trusted confidant, Herman Stoude. Frank waved the arrest warrant in her face and triumphantly proclaimed, “You are caught this time, and the best thing that you can do is to make a clean breast of it.” Mandelbaum responded by punching Frank in the nose. The other detectives had to restrain her to keep her from striking him again. She was released on $30,000 and rather than face trial, Mandelbaum managed to escape to Canada, reestablishing herself with over a million dollars worth of cash and diamonds. Mandelbaum died in 1894, while still living in criminal exile. Her body was returned to New York to be buried, and a number of the mourners at her funeral reported being pickpocketed.